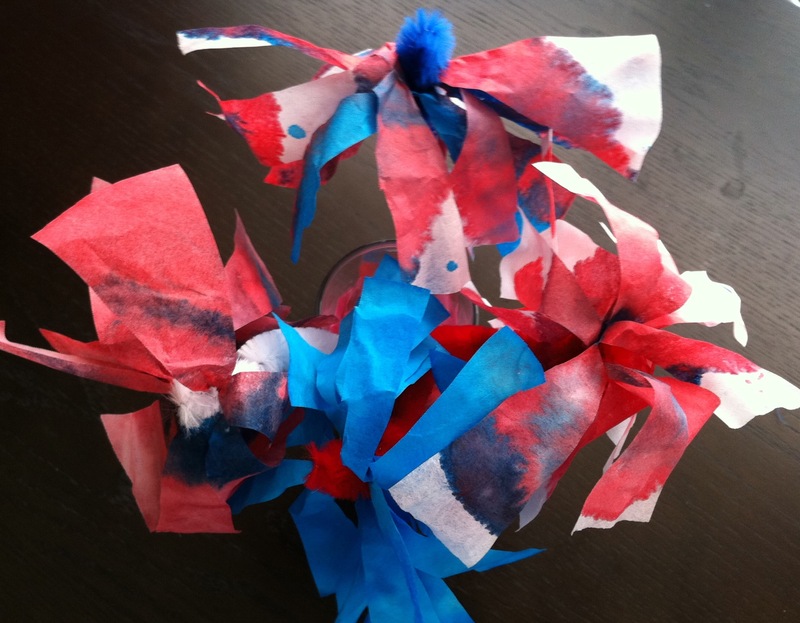 *chenille stems/pipe cleaners: I used Red, White and Blue. I used the big fuzzy ones, but any will work! 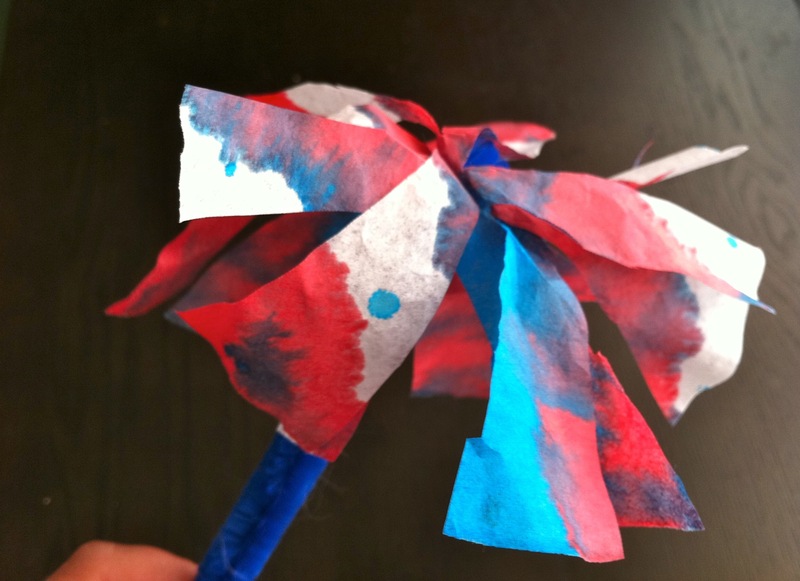 *red and blue watercolor paint: This was kind of a challenge, having the boys stick to just these colors, but you could cover the colors you don’t want them to use in scotch tape. *towel for drying, or just some counter space! 1. Place one of the coffee filters onto a paper plate or piece of construction paper and flatten out. This is just so the paint doesn’t get on your table! 3. Move the coffee filter to a towel or counter and lay it flat to dry. 4. Once the filter is completely dry (it doesn’t take that long) imagine a circle in the center of the filter. Cut the coffee filter in strips, working you way around the circle. Our strips were triangular in shape because we were cutting in a circle. I probably left a quarter size circle in the center of each filter and just cut around it. If you want to “draw” a circle in the center you certainly can and then just cut from the edge of the filter up to your drawn line all the way around. My 4 and 5 year old did the cutting and did a pretty good job…I held the filter for them and turned it so they could cut. You can see some of their jagged edges, but that makes it more special! 5. Cut a 1.5″ piece off of one end of a chenille stem and set aside. 6. Take the longer piece of chenille and poke it through the center of the coffee filter. There should be about 2″ of chenille poked through. 7. NOW, turn the entire thing upside down and grasp the filter in one hand. The long piece of the chenille stem should be pointed up. Gather the filter around the chenille and secure it by wrapping the extra piece of chenille stem that you cut off in an earlier step. Twist it around the part you are holding and turn the flower back upright. 8. Manipulate with your finger until strips are spread out and it looks the way you want it to. 9. It sounds more tricky than it is. I assure you IT’S NOT… It is actually pretty easy once you get the hang of it! Have fun!